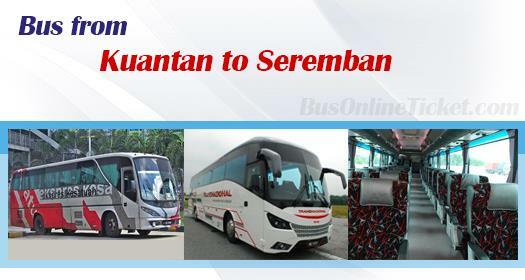 Bus from Kuantan to Seremban is the only mode of transport for local to travel between Kuantan and Seremban. Due to the fact that Seremban is not far away from Kuala Lumpur, with just 60km away, there are not many operators serving Kuantan to Seremban. Most of the services in the market are bus from Kuantan to KL. Kesatuan Express and Transnasional are the two only famous bus operators who running bus from Kuantan to Seremban. Both bus operators offer limited daily bus schedule for this route. Their combined trips have total 4 daily departures only. Kesatuan schedules are at 2:00am, 10:30am, 1:30pm while Transnasional schedule is at 3:00pm. Please note that there is no bus schedule for night session. The duration required for bus from Kuantan to Seremban is approximately takes about 4 hours, depending on the traffic and weather conditions. The duration would take much longer during festive season because of heavy traffic in Karak Highway. At least one washroom break would be given during the journey along the Karak Highway resting area. The bus fare for bus from Kuantan to Seremban is charged affordably in a range of RM 24.10 to RM 30.80, depending on your selection of bus operator. The departure point in Kuantan is in Kuantan Sentral Bus Terminal locating at Indera Mahkota while the arrival point in Seremban is in Seremban Bus Terminal One. Due to limited schedule for bus from Kuantan to Seremban, passengers are advised to book their bus ticket online in advance. Book your bus from Kuantan to Seremban now at BusOnlineTicket.com and receive confirmation email instantly after booking is made. Therefore, you will have a complete peace of mind before your trip.